Help prevent slips and falls with a slip resistant application. With our anti-slip coating you no longer need ugly non-skid strips or rubber mats. Protect the surface and maintain the original beauty of the material at the same time. 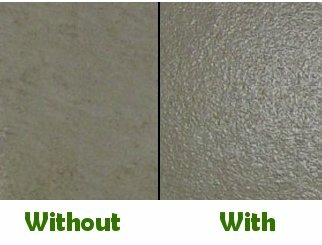 The fine aggregate of our coating, similar to 200 grit sandpaper, is nearly invisible to the eye and yet still addresses floor safety. Unlike strips or mats, our extremely durable slip resistant application does not attract dirt. Clean with a mild detergent or soap and water. Our anti-slip coating is a single solution that requires no mixing. This eco-friendly slip resistant application contains extremely low VOC’s, and has no fumes or odors. It bonds effectively with various tub and flooring surfaces, and won’t etch or damage your tub or floor’s natural appearance. It can be applied easily with a paint brush, paint roller or low pressure airless spray. The skid resistant coating goes on white during application; yet cures to a clear finish. Walk on floors treated with our slip resistant application in as little as 4-6 hours; however, for the best cure allow 24-48 hours. Our 8 oz bottle provides enough coating for slip resistant applications to approximately 20 square fee, when applied as a single layer coat. For a less noticeable slip resistant application, this product can be applied to the step through insert instead of the provided skid pad. In addition, you can treat nearly any surface including fiberglass, acrylic, glass, granite, marble, metal, plastic, vinyl, slate, tile, concrete, and wood. And it is a perfect fit for any indoor flooring surface such as concrete, ceramic tile and more. Purchase products from our online store or feel free call with any questions.